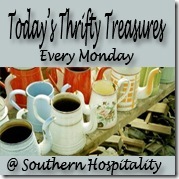 Back with another Thrifty Treasures feature and y’all found some really cool things out there. I hope to be back on my game again in the Fall, when I might actually need something and can get out to the yardsales again. Until I get in my house, I’m not at all sure I need a whole lot to fill in since I’ve got boxes and boxes all packed up waiting for the move to the new house. For some reason, dishes and furniture made my list this week, as well as a few other eclectic finds. You just never know what you will find out there in thrifting! Budget Design Girl found these adorable French style white ceramic farm animals at her local Goodwill for 99 cents each! How cool will these be in her kitchen? A side table for $6?! Yes, indeed, Kelly scored this one at a sale. It will be the perfect accent piece for a special spot in her house. A gallery wall of blank frames is a fun way to fill up that empty space. Add a pop of color and it really comes to life. Megan found these at the Goodwill. Live Love DIY helped her friend makeover this old rocking chair that she already owned. With a modern fabric and fresh paint job, this chair has a lot of life left in it. I love this piece! Vintage pyrex is always a great find and these old pieces are so nice to have around for leftovers. Sheila from Note Songs scored these pink beauties at her local thriftshop for $2.50 for all. Deal! Yardsales are the best place to find deals like this. Darlene from Our Creative Life scored 2 of these for $7.50 each. They will be gorgeous when they are remade. I can see a modern fabric on them with no tufting on the back. Hello gorgeous! Italy, I love Italy! And so does Barb at Grits and Glamour. She was out thrifting and found a whole set of Italian dishes for $135 and later found out that each plate sells for $65. Her bloggy friends enabled her and talked her into going back and buying this set, after she originally passed it up because she didn’t need more dishes. That never stops a blogger, right?! And that’s what friends are for. She spotted these on a cart at Goodwill and Parsimonia is back with some frugal finds in these Firestone jadite mugs. Always a winner! A $30 Craigslist vanity gets an Annie Sloan paint wash along with a little golden glimmer from Grandma glam painter, Salvage Collection. Lovely piece! Hi Rhoda, after linking up I wondered if my post was not quite right. My old doors are 2nd hand. One did come from an antique store and the other I bought at Roberts Crafts when they were going out of business. I got it for a great price. I found some great thrift items today. I will share them next week and they will be more what your party is about. Feel free to delete my link if you feel it isn’t appropriate. Thanks for hosting. I love thrifting. Thanks for hosting. I collect pyrex mostly and then fire king and paperweights as my main collectibles. Always like finding sites that show thrifted/2nd hand treasures. Thanks for hosting. So glad this is back! Thank you for hosting. so glad to have this party to look forward to again each week! thanks so much for the feature… what a boom to my blog! !